Morrison Institute of Technology offers a thorough technical education to its students. 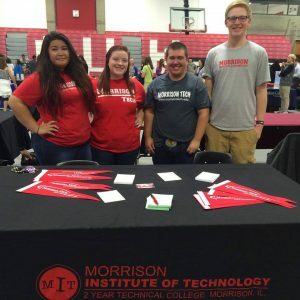 The experience students encounter at Morrison Tech prepare them for lives of achievement and success in the technological world. Your gift to the College will help us maintain the academic excellence and professional growth that makes achieving a degree at Morrison so powerful. Your gift might help a student attend Morrison by supporting scholarships or support the development of educational opportunities in an emerging technical field with a contribution to our Technology Enhancement Initiative. Or you might give where the need is greatest by making an unrestricted gift to the Morrison Institute Fund. Giving to Morrison Institute of Technology can take many forms, from annual contributions to bequests and life trusts to gifts-in-kind. Whichever method you choose, you may direct your donation to the giving opportunity that most interests you. *Morrison Institute of Technology is a 501(3c) not for profit institution. All donations to its giving program are tax deductible.